When F-35 Joint Strike Fighter pilots take to the air in coming years, not only will their plane not be suitable for combat, it won’t even be fully developed. Indeed, performance in multiple essential mission areas will be “unacceptable,” according to the Pentagon’s top weapon testing official. In a memo obtained by the Project On Government Oversight, Dr. Michael Gilmore, Director, Operational Test and Evaluation (DOT&E), warns that the Joint Strike Fighter Program Office (JPO) has decided to cut short the F-35’s development phase in order to pretend that schedule and cost goals are being met. Contractors, the JPO, and Pentagon acquisition officials have failed for years to deliver on their grandiose promises of program success. Now the program appears to be out of money, with lots of development testing and re-engineering left to be done. Instead of admitting to these failures, F-35 program officials are kicking the development can into the future by arbitrarily cutting short this process now with the intention of eating into funds set aside for operational testing and production later. The F-35 Program Office is now belatedly asking for some additional funds to complete development while simultaneously asking Congress to approve its plans to buy increasing numbers of new, incompletely-developed production aircraft they know will require extensive and expensive modifications. The current block buy plan of 410 aircraft could cost between $34 billion and $54 billion, depending on whether you believe the optimistic public statements of Pentagon officials or the figures released in more subdued fashion. He also warns that if the Joint Program Office persists in its current plan, there is a high risk the F-35 will fail operational testing. If the F-35 fails, this will require an expensive correction process followed by a repeat of the entire operational test program. The test rerun alone would cost taxpayers an extra $300 million. Engineering the fixes and installing them on all the production aircraft would cost vastly more. Following an article on the Gilmore memo published on Bloomberg, Senate Armed Services Committee Chairman John McCain (R-AZ) sent a letter to Defense Secretary Ashton Carter raising concerns that Pentagon officials had misled the committee about the progress of the program. He specifically challenged statements from F-35 Program Manager Lieutenant General Christopher Bogdan that development would be finished in late 2017. He also questioned Air Force Secretary Deborah James certifying that the program had the funds necessary to complete development on time, since it was clearly refuted by the testing memo. Given “the troubled performance, continued delays, and persistent cost overruns of this program,” Senator McCain disputed the Department of Defense’s insistence that the current requirement for 2,433 F-35s was realistic and affordable and recommended the Department adjust its buy quantity based on actual costs and schedule. Rather than completing the development phase, let alone the highly critical combat-realistic operational tests (OT), F-35 advocates on Capitol Hill and in the Pentagon seem to place the survival of their too-big-to-fail program ahead of building a warplane that works in combat. The current Congressional authorization and appropriations bills have increased the F-35 buy beyond the Pentagon’s request. Not satisfied with this add-on, 70 House members want to fund an additional 11 aircraft. Though problems in the plane’s structure, aerodynamics, engine, and reliability also abound, the latest schedule delays are largely due to continuing problems in developing F-35 mission system software. The mission software controls every input the pilot receives regarding threats, targets, weapons, and the mission profile to be flown. As the Air Force has claimed repeatedly, the mission software (if and when it works) is, together with stealth, intended to be the most important advantage of the F-35 over all current fighters. The early, rudimentary versions of the software now installed in the operational fleet—Block 2B and 3i—enable the F-35 to conduct only basic flight and to fire one radar missile model and one type of guided bomb. Yet even this rudimentary system software has repeatedly failed developmental tests—and is too limited in combat capability at this point to even enter combat-realistic operational testing. Despite some progress, in flight science testing each variant is well behind planned test point goals for the year (data as of the end of September). The new mission systems software needed to perform the plane’s real combat functions—close support of troops, deep strike bombing and air-to-air fighting—is being released in an alphabet soup of software upgrades, increments and block packages. Each version adds a few extra capabilities and attempts to fix the failures in earlier versions. The version currently in development test, Block 3F Revision5 (3FR5), added a few weapons and was supposed to reduce the frequent computer crashes of the previous version. These crashes, Dr. Gilmore wrote, forced the pilot to shut down and restart the radar in mid-mission. Developmental Revision 5 will still fall short of the minimum range of combat capabilities the F-35 needs to even begin realistic operational testing. To start those crucial tests, the F-35 needs another upgraded software version, Block 3FR6, which has yet to be developed. With a mountain of development test failures, costly fixes and retests staring them in the face, the JPO decided to arbitrarily truncate the developmental test phase and to defer all the unfinished development tests and retests to later operational test phase. Those developmental tests and retests will be funded by operational test budgets, which don’t yet include money for such testing. Dr. Gilmore’s memo warns that this is a highly risky proposition. In useful and realistic operational tests, fully developed weapons systems that have passed their development tests and met their design specifications are put through their paces performing missions in realistic combat conditions. To begin combat testing a weapon system that still needs engineering development fixes and retests–and to conduct these engineering tests in the middle of the operational test schedule—is courting disaster. Incompletely developed F-35s undergoing rigorous combat tests will certainly experience new design failures. These must be corrected and tested again, a potentially lengthy process. Repeatedly stopping operational tests to fix basic design problems that should have been completed during development will wreck the carefully crafted operational test plan and schedule that have been in place for more than four years, as agreed to by the services and DOT&E. The result will be more delays and increased costs, exactly what critics of Dr. Gilmore and defenders of the F-35 say they want to avoid. When the Pentagon restructured the F-35 program in 2012 it postponed production in order to decrease concurrency in the program, which is overlapping production before development and operational testing is complete, violating the principle of “fly before you buy.” The JPO’s truncation of development is a deliberate increase in the F-35’s concurrency. The stated purpose of concurrency is to speed up the schedule and save money, but the real motive is to protect an increasing flow of procurement funds against any possibility of slowdown or cancellation due to failure in testing—a practice that has rightly been called “acquisition malpractice.” Moreover, history has repeatedly shown us that it actually delays programs and adds to costs. The F-35A’s internal cannon, a critical weapon both for close support and dogfighting, remains problem-ridden and needs further development. When the cannon’s stealth-preserving door opens, the extra drag on one side turns the plane’s nose enough to spoil gun-aiming. Engineers hope that flight control software changes can cure the problem, but that remains to be tested. Far more serious is the fact that the only sight for aiming the gun is the $600,000 Helmet Mounted Display. The very first shooting accuracy tests with the helmet, scheduled for October 2016, have been delayed until 2017 due to the software delays. There are strong engineering reasons to believe that the helmet sight is incapable of meeting the plane’s gun accuracy design specifications. Pilots have reported that the helmet’s displayed symbols can lag behind their eye’s movement while they are flying through turbulence or being buffeted during hard maneuvering. Whether the gun is actually combat suitable or not will not be known until realistic operational test results become available in 2020--at the earliest. The Navy and Marine Corps F-35 variants will have even more serious gun accuracy problems because both use an external gun pod with an unavoidably less rigid mounting than the internal cannon. Firing this pod creates recoil forces that pull the plane’s nose down, potentially creating worse effects on accuracy than the F-35A’s muzzle door. A software solution has yet to be completed. As reported by DOT&E, the JPO is addressing these concerns by deleting all cannon lethality and accuracy requirements from the program’s contractual Operational Requirements Document—without formal approval from either the services or OSD. The contractor now has no contractual responsibility for air-to-air or air-to-ground accuracy and lethality. Should the F-35 cannon prove incapable of hitting or destroying targets, in test or in combat, no one can be held accountable nor can the program be stopped until a fix is found. Before proceeding to combat-realistic operational testing of the F-35’s weapons capabilities, the developmental weapons delivery accuracy tests must establish, for each air-to-air and air-to-ground weapon, that the F-35 can accomplish its “find-fix-identify-track-target-engage and-assess” functions according to specification. Only after these functions are verified can more stressful and combat-realistic testing of the same “kill chain” be operationally tested. It is pointless to do these complex, expensive operational tests with a weapon that fails to see and or hit targets under benign engineering test conditions. The F-35 has had occasional successes in developmental accuracy tests so far, but according to DOT&E the overall results are not promising. During several events, testing officials had to resort to “control room intervention” to make tests appear successful. As an example, the memo describes how a recent test of the long-range AIM-120 radar air-to-air missile required the controllers on the ground to tell the pilot when to fire because the F-35’s radar and computer system failed to display any enemy target cues. Moreover, 13 of the scheduled developmental weapons accuracy tests have yet to be performed. JPO has not stated whether these will be ignored, completed during the development phase, or kicked down the road into the operational testing phase. These incomplete weapons tests could not be flown because program managers had to fix and retest numerous failures uncovered in earlier tests, thereby using up the available test range time and money. Dr. Gilmore warns that unless these weapons accuracy tests are rescheduled, funded, and completed during the F-35’s development phase, they will have a major disruptive effect on the operational test phase. This would result in more schedule slippages, cost overruns, and possibly even jeopardize any ability to assess the combat suitability of the F-35. Simply following the agreed test master plan to complete all weapons developmental testing before operational testing starts is, technically and ethically, clearly the right thing to do. Unfortunately, that requires JPO and OSD official to admit to more cost and schedule growth, refuting their ongoing narrative that all problems are being solved, the program is on track, costs are going down, and the concurrent production of scores more F-35s should not just continue but accelerate. As we reported earlier this year, the current F-35 program is at significant risk of never being ready for combat. That assessment was based on an official Air Force internal review of their own testing data. He said that at the precise moment when the testing process was falling further and further behind. According to the latest DOT&E memo, as of the end of September 2016 the program had only completed 65 percent of the scheduled flight test points, 1,120 short of the 3,189 planned. Rather than redoubling their testing efforts to catch up, the JPO decided to terminate flight testing scheduled for early 2017, arbitrarily declaring development of the Block 3F software to be finished by then. A number of the combat capabilities that were expected to be completed for the F-35A’s August IOC date have only recently entered developmental flight testing. Others haven’t even made it that far, thereby rendering the planned 2017 date for startup of operational flight testing wildly premature. An immature design is not the only factor imperiling useful operational testing of the F-35’s combat suitability. Dr. Gilmore warned that JPO officials, perhaps deliberately, have not scheduled and funded enough operational test-ready aircraft to conduct the planned combat tests. The number of operationally typical, production representative F-35s required is one of the key criteria for starting operational testing. The Test and Evaluation Master Plan agreed to by both DOT&E and the F-35 Joint Program Office requires 18 aircraft, each with the necessary flight test instrumentation installed and tested, were needed to begin the testing program. But the F-35 Program Office is not even pretending to go through the motions of executing the operational test program they agreed to. F-35 program officials have yet to plan or contract for the necessary test aircraft, despite knowing for 7 years they were required to do so. In contrast, they have been diligent indeed in making sure taxpayers were on the hook for $6.1 billion to buy more incomplete, untested F-35s. The Program Office has repeated that same pattern of neglect in managing the other essentials for completing the thorough operational testing of the F-35, including verified, fully realistic, man-in-the-loop mission scenario simulators and fully tested threat electronics simulators for the test ranges. Without these essentials, it is impossible to test the full capabilities of the F-35. As an example, no one is going to fire a missile at an F-35 during testing to see if the stealth capabilities and counter-measures will work. The only way to test many of the F-35’s capabilities is in a virtual simulated environment because the test ranges cannot accurately replicate the full spectrum and quantity of threats the jets would confront. Politics, particularly election year politics, is always a factor in any large weapons program. The F-35 is certainly no exception. From the very beginning, the plane’s program managers have diligently worked to ensure the F-35 is bullet-proof—or, more accurately, that its funding is bullet-proof. Components of the aircraft are built in 45 states. By evenly spreading F-35 subcontracts across the United States, the defense industry has ensured the F-35 has plenty of friends on Capitol Hill. Many of these friends banded together recently to convince their colleagues of the need to buy more F-35s. 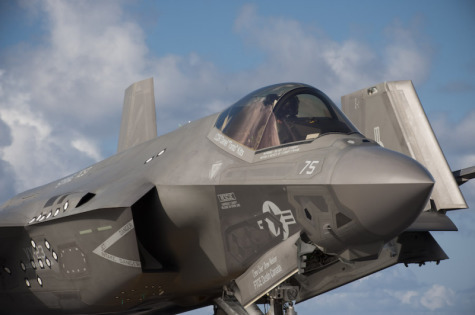 A letter, signed by 70 members of the House Joint Strike Fighter Caucus, urged members of the House Defense Appropriations Subcommittee to support the Senate’s plan to add $100 million for advanced F-35 procurement. The advanced procurement funds would allow the Air Force to buy some of the parts for new F-35s in 2017 so they can be built and delivered in 2018. This spreads out the cost of these F-35s over at least two years. It would also conveniently commit taxpayers to buying these planes now, long before the operational tests have a chance to determine whether or not the F-35 is effective in combat. This fact was somehow omitted from the lawmakers’ letter. Not surprisingly, an analysis of campaign donation data by the Center for Responsive Politics shows most of the letter’s signers benefited from defense industry campaign contributions in the 2016 election cycle. The co-chairs of the Caucus, Representatives Kay Granger (R-TX) and John Larson (D-CT), received $144,300 and $43,150 each, respectively, in contributions from major contractors and unions with a stake in the program. With members of Congress serving as boosters for the F-35, there is little doubt that program officials in the Pentagon are feeling the pressure to keep the F-35 budgets growing as rapidly as possible. Despite the desperate state of F-35 development and testing now and for the foreseeable future, the JPO is planning to award contracts to develop the expanded and presumably more expensive Block 4 “full capability” aircraft in 2018. The specifics of Block 4 remain undefined, and these contracts for new planes may well be signed before the currently planned IOT&E of Block 3 planes has even begun. There is no telling how many new F-35 problems will be discovered as the program limps to the initial operational test finish line. The JPO and its co-advocates throughout the Pentagon and Congress steadfastly defend staying with the present unworkable schedule in order to buy more F-35s guaranteed to have a plethora of known and yet-to-be-discovered-deficiencies. Attempting to design and produce a large number of Block 4 F-35s now, when the program management avoids completing or testing the Block 3 F-35s, is the aeronautical equivalent of a construction company deliberately building an inadequate foundation yet continuing to build a skyscraper on top of it. The F-35 program has been a fifteen-year saga of performance failures, schedule delays, and cost overruns. When Lockheed Martin won the contract to develop the aircraft just weeks after the September 11, 2001 terrorist attacks, they promised the Air Force and Marine Corps would be flying brand new fully capable new fighter jets in 2008, with the Navy following suit in 2010. They planned for 2,866 F-35s for just under $200 billion. But here we are in 2016 with the revised plan of 2,457 aircraft for just under $390 billion, which means we are paying double the unit cost, ultimately adding up to almost $200 billion more for 409 fewer aircraft. Frank Kendall, the current Undersecretary of Defense for Acquisition, Technology, and Logistics famously described the practice of buying F-35s before the aircraft has been fully developed as “acquisition malpractice.” He was certainly right in 2012 when he said that, but since then has taken few steps to lessen, much less end, that malpractice. By proceeding with their current plan to truncate F-35 development testing and to not fund (or underfund) the operational test aircraft, instruments, mission simulators, and urgently needed threat simulators, they are in effect sabotaging any realistic testing of the combat suitability or unsuitability of the F-35. Underfunding these efforts increases the likelihood of failing to identify and correct preventable problems in testing and leaves pilots having to address deficiencies in combat. The new President, new Congress and new Secretary of Defense need to exercise the oversight necessary to stop this bureaucratic sabotage. As a first step, they need to stop expanding the annual F-35 buy. Those savings should be transferred to finish F-35 development and development testing as originally planned. Thorough, truly realistic operational testing of the F-35 must be fully funded and overseen by a Director of Operation Test and Evaluation tough and honest enough to get that difficult job done. The men and women who will risk their lives taking these fighter jets into combat deserve nothing less. Click here for the original version of this article, on the POGO website.